Hard cider isn&apos;t a just a fad. In fact, all across the country cidermaking is booming and Michigan ranks third in the U.S. in terms of cider production, with 9.3 percent of the nation’s cider makers. Unlike the familiar sweet cider sold in plastic jugs each fall at farm markets and fruit stands, hard cider is a clear, fresh-flavored slightly carbonated beverage that’s usually served in bottles or fresh from the tap. Like wine, it can be sweet or dry, and its alcohol content can be anywhere from 3% to 7% or more, and it’s increasingly popular with consumers who are looking for a fresh-tasting alternative to beer or wine. The popular turn to cider fits in well with the area’s agricultural ethic, since it encourages partnerships between cidermakers and nearby farmers. That’s particularly evident at the region’s only fully-dedicated cidery, Tandem Ciders, just northwest of Suttons Bay. Owners Dan Young and Nikki Rothwell list the orchards where the apples in each blend come from as well as a barrel-aged pommeau made from sweet cider blended with apple brandy. Thanks to its proximity to the cool waters of Lake Michigan, the Grand Traverse Bay region has been one of America’s most productive fruit-growing areas in the U.S. While the area’s growing reputation as a wine-producing region has prompted some farmers to replace their apple and cherry orchards with vineyards, there are still many areas that are better suited to apples. On tap, in a growler and even in a six pack of cans, cider is now available at many of the local wineries. 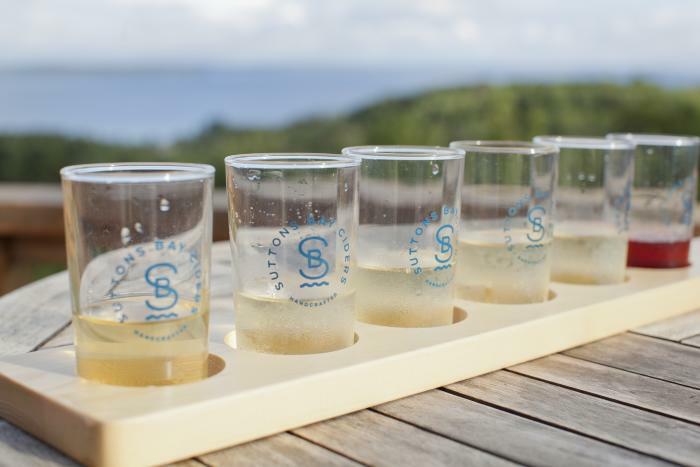 For an assortment of styles try the offerings at Forty-Five North or the Spirit Cider at Bowers Harbor Vineyards. One of the standouts among the area’s cider-making wineries is Left Foot Charley, Traverse City’s first “urban winery,” which started dabbling in cider in 2008 with a small 100-gallon run. Ulbrich makes his cider in small batches, so the menu in his Grand Traverse Commons tasting room changes regularly. There are some standbys like Cinnamon Girl, a lightly-spiced, slightly sweet cider. And, for yet another cider option head north on M-22 to Suttons Bay Ciders off Hilltop Road (between Traverse City and Suttons Bay). Owners Mark and Madelynn Korzon use apples from their own orchard -- and even some wild apples -- in their ciders. The tasting room has a wide deck with sweeping views of West Bay and Power Island.